WASHINGTON — For all the talk about the different lanes in the 2020 Democratic presidential race, there's one emerging reality when it comes to the issue divide. It's essentially Bernie Sanders versus everyone else. Think about it: Sanders is the only self-avowed democratic socialist, while the other Dems have declined to explicitly embrace that label, with many saying they're a capitalist — in some form or fashion. On health care, as he reintroduces his Medicare for All Act, Sanders has ruled out a role for private insurance other than for cosmetic surgery. And outside of Kamala Harris, the other top-tier Dems (Beto O'Rourke, Pete Buttigieg, even Elizabeth Warren) still envision some kind of role for private insurers — even as they all talk about "Medicare for All" or embrace it as a goal. And on free college tuition versus debt-free college, Sanders is the one promising free college tuition. The others are more focused on refinancing debt and subsidizing tuition for community colleges. The bad news: He's increasingly on an island on these issues. The good news: Like in 2016, he gets to cast himself as the pure candidate when it comes to capitalism versus socialism, on single-payer, and on free college tuition — even as the party is closer to him on the issues than it was four years ago. But the question for Democratic primary voters: Is it better to be pure on these issues? Or is it better to have flexibility - given the poll numbers on these stances? Speaking of Sanders… He has railed against the "millionaires and billionaires." And now he's one of them. 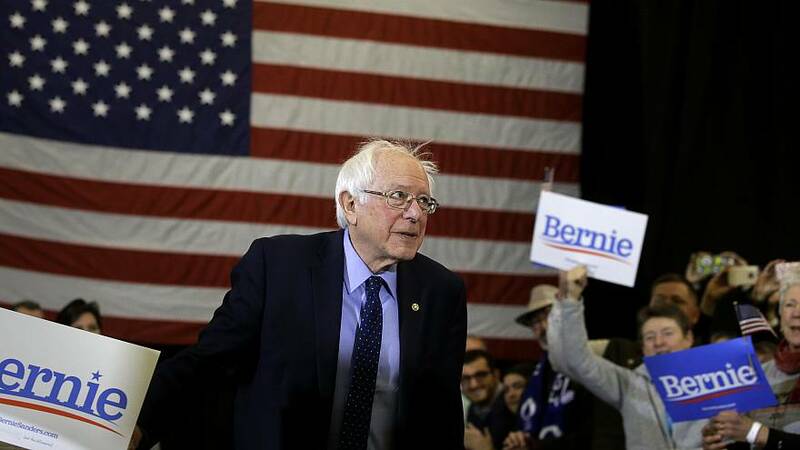 As he's set to release 10 years of tax returns on April 15 - after issuing just one tax summary (of 2014) in his last presidential campaign - Sanders admitted to the New York Times that he's now a millionaire due to book royalties. The Times notes that Sanders' 2017 Senate financial disclosure forms "show he earned roughly $1.06 million that year, more than $885,000 from book royalties. His most recent book, 'Where We Go From Here,' was published last year." Speaking today before the North America Building Trade Unions legislative conference in DC are John Hickenlooper (at 9:10 am ET), Elizabeth Warren (9:25 am ET), Kamala Harris (9:40 am ET), Tim Ryan (9:55 am ET), Eric Swalwell (at 10:45 am ET), Cory Booker (at 11:00 am ET), and Amy Klobuchar (at 11:30 am ET)… Harris also holds a town hall in Iowa… Julian Castro has a "People First" rally in San Antonio… And Jay Inslee has a town hall with CNN in DC. "With 96 percent of the votes counted, [Prime Minister Netanyahu's] Likud and Benny Gantz's Blue and White party both had won 35 seats each," per NBC News. "But Netanyahu was in a stronger position to form a coalition government with the anticipated support of right-wing and ultra-Orthodox Jewish parties, Likud's natural allies. Such a coalition could have as many as 65 votes in the 120-member parliament." More from F. Brinley Bruton and Paul Goldman: "The results affirmed Israel's continued tilt to the right and further dimmed hopes of a negotiated solution to the Israeli-Palestinian conflict." We're going to find out how much of the recent Trump-Netanyahu alliance on the Golan Heights and the West Bank was campaign saber-rattling - or whether it was real. Oh, and one other reminder: Winning an election in a parliamentary system is the first step; forming the actual government is the next. And that can be a messy process. Data Download: The number of the day is … 58 percent. That's the president's approval rating on the ECONOMY, per the first Georgetown Institute of Politics and Public Policy "Battleground Poll" of the 2020 cycle. NBC's own Kyle Stewart writes that the president's high marks on his economic performance contrast with his 55 percent overall disapproval rating. And/but: 59 percent of voters also say they are very or somewhat concerned about an economic downturn. Don't miss the pod from yesterday, when we looked at how Virginians view their elected officials after a series of scandals earlier this year. An exclusive from NBC: The Trump administration wants to put border agents in charge of the asylum process. Jared Kushner and Stephen Miller may be on a collision course on immigration. Mick Mulvaney is trying to "let Trump be Trump." AG William Barr says he's "reviewing the conduct" of the FBI's 2016 probe of the Trump team's Russia contacts. POLITICO has a scoop on the president's odd comments during a visit to Mount Vernon. The Trump administration wants to dismantle OPM. Steve Mnuchin says White House lawyers consulted the Treasury Department on Trump's tax returns. Some Republicans are speaking up about concerns over Trump's shakeup at DHS. The acting deputy secretary at DHS is now officially out — to pave the way for new acting director Kevin McAleenan. Some of Kirstjen Nielsen's allies are trying to help her repair her image. It could be a tough sell. Lawmakers held a hearing on white nationalism. The scene on the Youtube livestreams was … illustrative. Josh Lederman has the latest on how Team Pence is pushing back on Mayor Pete. Bernie Sanders is set to reintroduce his Medicare for All Act. Some conservatives have nice things to say about Pete Buttigieg. Kirsten Gillibrand is making more apologies for her past record on immigration. Democratic candidates are courting young voters — again. Will they show up in the primaries? Democrat Dan McCready has raised $1.6 million in his quest to win in the fall's NC-9 special election. Unions are holding back on their 2020 endorsements for now.